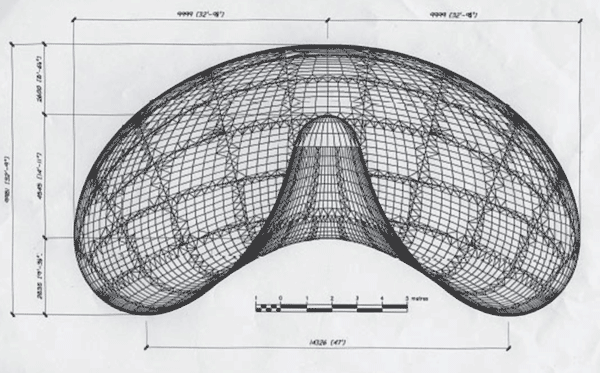 The structure of Cloudgate directly correlates to the structure of Kapoor’s sculpture of the same name. The music forms a palindrome through the repetition of six distinct musical sections (A-B-C-D-E-F-F’-E’-D’-C’-B’-A’ ). Each section features symmetrical motives inspired by the object’s reflective qualities. During the middle F section, the music mimicks the visual phenomena of the scultpure’s “omphalos” – a concave chamber that warps reflections – through the use of copious extended techniques. The structure of Cloudgate directly correlates to the structure of Kapoor’s sculpture of the same name. 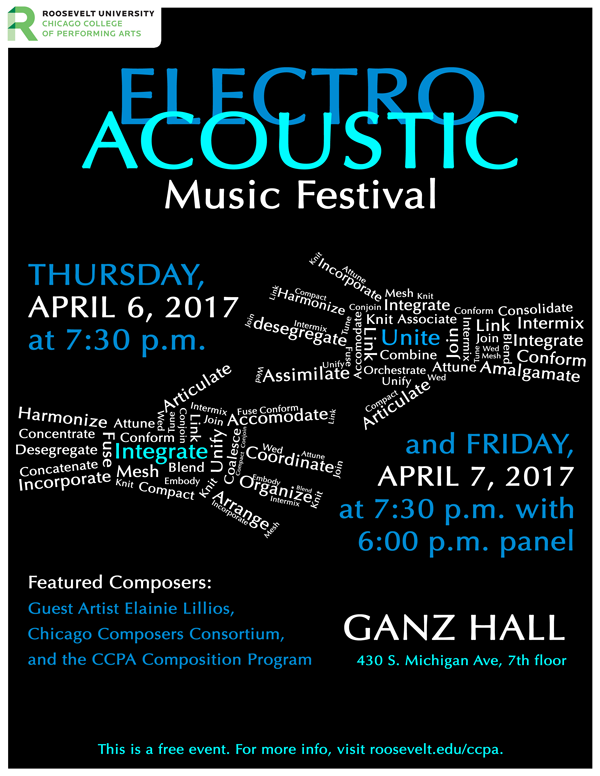 The second day of the Chicago Electro-Acoustic Music Festival features music by several consortium composers: Beth Bradfish, Kyong Mee Choi, Tim Edwards, Casey Ginther, Tim Johson and Betsy Start will all have works presented on Friday, April 7 at 7:30 PM. There will be a panel discussion with the composers including the featured guest composer, Elainie Lillios, preceding the concert at 6:00 PM. 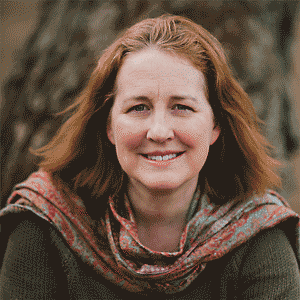 Elainie Lillios’ (featured guest composer) music reflects her fascination with listening, sound, space, time, immersion and anecdote. Her compositions include stereo, multichannel, and Ambisonic fixed media works, instrument(s) with live interactive electronics, collaborative experimental audio/visual animations, and installations. Recent awards include a 2016 Barlow Foundation Commission Award, a 2013-14 Fulbright Scholar appointment in Thessaloniki, Greece, First Prize in the 2009 Concours Internationale de Bourges, Areon Flutes International Composition Competition, Electroacoustic Piano International Competition, and Medea Electronique “Saxotronics” Competition and Second Prize in the 2014 Destellos International Electroacoustic Competition. Her music has also been recognized/awarded by the Concurso Internacional de Música Electroacústica de São Paulo, Concorso Internazionale Russolo, Pierre Schaeffer Competition, and La Muse en Circuit. The World Series moves our concert time! Cheer on the CCC, Quintet Attacca AND the Cubs this Sunday! The time of the Sunday October 30 concert has been changed to 2:00 pm in order to avoid conflict with the evening World Series game. Elizabeth Younan’s piece Shoreditch Grind is winner of the 2016 c3 competition. …and the winner is… Shoreditch Grind! On October 30, Quintet Attacca will feature the winning composition Shoreditch Grind by Elizabeth Younan. The piece is the winner of the Chicago Composers’ Constorium’s first composition competition. This video shows a performance by the Arcadia Quintet on vimeo. We are excited about our call for scores for the October 30 Quintet Attacca performance. Deadline May 28, 2016. C3 collaboration with Clocks in Motion percussion ensemble! Timothy Ernest Johnson’s Ritual Dance Spirit, a quartet for percussion instruments of indefinite pitch. Drums, cymbals, wood blocks, and various hand percussion dominate the texture. Inspired by Korean Shaman ritual, New Orleans stomp and Arabic rhythms, the music also incorporates jazz elements in its freedom of embellishment and improvisation. Lawrence Axelrod’s Emeq, which takes its titles form the Yup’ik (Alaska tribe) word for water. This piece captures water as a sonic experience in three very distinct forms. In Elizabeth Start’s Spoiler: 5 Disruptive Vignettes “Corrections” involves increasingly insistent reiterations of quarimba pitches (1/4 tone low) and sequences on other instruments that are tuned at the “right” pitch. “Dance Trip” sets up a dance rhythm that gets knocked off balance in various ways. “Culture Shift” takes us from a somewhat Asian inspired atmosphere to a more rigorous Western European approach. “Colateral Damage” begins with a quiet village scene obliterated by heavier forces. “Progress” takes us on a whirlwind history of music, from chant, early organum, Baroque, classical, etc., ending with serialism. Hailed as “nothing short of remarkable” (ClevelandClassical.com) and “the most exciting addition to Madison’s classical music scene” (The Isthmus), Clocks in Motion is a group that performs new music, builds many of its own instruments, and breaks down the boundaries of the traditional concert program. 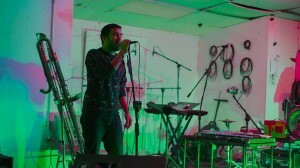 Formed in 2011, Clocks in Motion is quickly becoming a major artistic force in today’s contemporary music scene. Among its many recent and upcoming engagements, the group served as performers at the Interlochen Arts Academy (MI), The Stone (NY), The Overture Center for the Arts (WI), Casper College (WY), University of Michigan (MI), Baldwin-Wallace University (OH), The University of North Carolina-Pembroke (NC), and The Ewell Concert Series (VA). 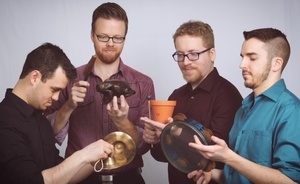 With a fearless and uncompromising ear to programming challenging and adventurous contemporary percussion ensemble repertoire, Clocks in Motion consistently performs groundbreaking concerts which involve performance art, theater, and the construction of new instruments. Clocks in Motion’s instrument collection now includes a set of 88 microtonal steel pipes known as the Galvitone, a microtonal marimba known as the Quarimba, and six sets of Sixxen, large metal microtonal keyboard instruments built for Xenakis’ 1979 masterpiece, Pleiades. These instruments serve as a great resource and inspiration to the creation of new music and are useful in the performance of pre-existing works. Featuring world premieres alongside rarely performed classic works, Clocks in Motion strives to create a new canon of percussion repertoire. Not only known as a virtuosic performing ensemble, Clocks in Motion works passionately to educate young audiences through master classes, residencies, presentations, and school assemblies. The individual members of Clocks in Motion’s unique skill sets and specialties contain an impressive mix of musical styles including, rock, jazz, contemporary classical music, orchestral percussion, marching percussion, and world music styles. Clocks in Motion works regularly with all age groups in accessible hands-on workshops. A veteran to the Experimental Sound Studio, Alejandro Acierto performs three pieces for three different media this Sunday at 7:30 pm. Ceaseless Cease depicts the endless turmoil of the human condition that stems from human desire. If we try to stop desire, however, we create another form of desire. 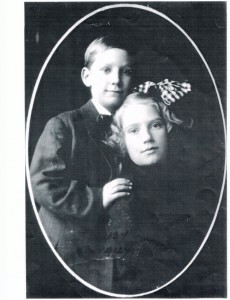 The title refers to this dichotomy in the attempt to end what cannot be ended. This is one of a series of pieces that transforms sounds from the clarinet captured on microphone during performance. As part of my last recorded project Amid These Traces, this work foregrounds the voice as an expressive and conceptual subject embodying strategies of constraint. As a way to consider the body, presence, and communication, the voice is interrupted in multiple iterations through live processing. Caught in the moment of communicative dis-clarity, this work draws on improvisational parameters – colliding in ways that reference the virtuosic demands of classical music’s “new complexity.” Through this work, the vestiges of language glisten though words are never spoken. The normalization of stutterances forces us to contend with its about- to-ness – as pregnant combinations of breath and sound prevail. Pushed towards exhaustion, frustration, and physical (dis)ability, the body’s facility to communicate is troubled. These residual sounds that remain after the voice has undergone multiple constraints are the traces of language that linger between music, speech, communication, and utterance. Alejandro T. Acierto is an artist and musician working in time-based media. He has exhibited his work at the Film Society of Lincoln Center, Issue Project Room, Museum of Contemporary Art Chicago, Art Institute of Chicago, Salisbury University, SOMArts and presented performance works at the Brooklyn International Performance Art Festival, Center for Performance Research, and Center for New Music and Technology. Acierto has held residencies at Skowhegan School of Painting and Sculpture, Virginia Center for the Creative Arts, Banff Centre, High Concept Laboratories, and Chicago Artists’ Coalition. He is currently a FT/FN/FG Consortium Fellow, a Center Program Artist at the Hyde Park Art Center, and teaches at UIC and Truman College. 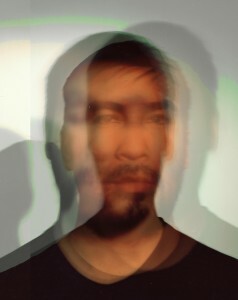 Acierto received his undergraduate degree from DePaul University, a MM from Manhattan School of Music, an MFA in New Media Arts from University Illinois at Chicago, is a recipient of the Kranichsteiner Musikpreis at the Darmstadt Festival for New Music, and founding member of contemporary chamber orchestra Ensemble Dal Niente in Chicago. You can find out more about him at alejandroacierto.com. Skallagrimsson, for 2-channel tape and piano, is based on a solo piano piece (Piano Solo No. 8 – Skallagrimsson) which I wrote in 1989. It is in four sections (fast, fast, slow, fast). The close synchronization required between the performer and the tape reminds me at times of John Henry’s race against the railroad spike driving machine. Hopefully our performer will not suffer his fate (I haven’t lost anyone yet). The name of the work comes from the title character of Egil’s Saga, Egil Skallagrimsson. Egil’s Saga, one of the major Icelandic sagas, was written around 1230 AD, possibly by Snorri Sturlason. Egil Skallagrimsson, like many Icelandic saga character, is full of contradictions. He is a hulking, violent brute with a misshapen head and an axe nicknamed Skullsplitter, and he is also a poet of great talent and renown. The Chicago Composers’ Consortium continues its 2015-16 season with our annual program devoted to works using various electronic media. We are proud to be the only new music group in Chicago that presents such a program every year, exploring the possibilities of acoustic plus electronic media. The concert will hold a variety of works for solo instrument or small ensemble and electronics.Alejandro Acierto is our guest clarinettist. He will also present one of his own works. The program spans many moods and composition techniques and will include Ceaseless Cease by Kyong Mee Choi, Aurora inscrutabile by Timothy Ernest Johnson, Melt by Beth Bradfish, Water Study #2 by Timothy Dwight Edwards, Skallagrimsson by David Heuser and a new work for Theremini by Betsy Start. Other performers will include Lawrence Axelrod, piano, Craig Hultgren, cello, Timothy Ernest Johnson, guitar and Betsy Start, theremini and cello. The Experimental Sound Studio provides the perfect environment for this music with quality equipment and comfortable intimate seating. Join us for this unique and challenging program!